So far Evgeniy has created 9 blog entries. Hello tycoons! Merry Christmas and Happy New Year! This year was very busy and fruitful. We put together the first playable build and showed it at Gamescom. And we are still dealing with feedback 😂. We have long discussed and thought in what form and when to release the game. But, thanks to the work after the exhibition, it became clear that in its current form this would not be something that we had originally conceived and could deceive the expectations of many. Therefore, it was decided to move the release to 2019. We are announcing this now because until the last moment we were not sure. However, this will definitely benefit the game. Much has been done since the last the devblog. Much more to be done. New UI. Our goal is to make the game intuitive. 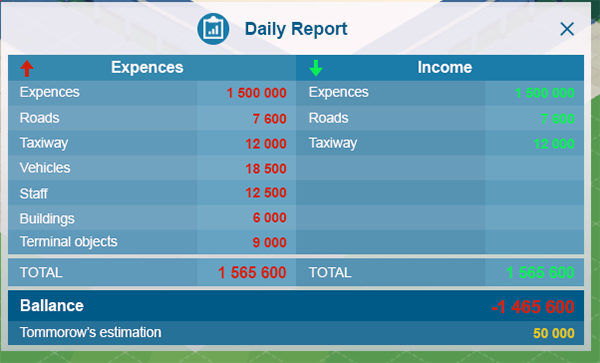 Now the player sees all the income and expenses on the screen. If any aircraft or vehicle has a problem, a specific icon(badge) appears hovering that aircraft or vehicle. In addition, every day the player can see a daily report with a detailed description of income and losses. Parking. Now the vehicles are in the parking lot. You can see what vehicles and how much space is left in them. If necessary, you can transfer equipment from one parking lot to another. 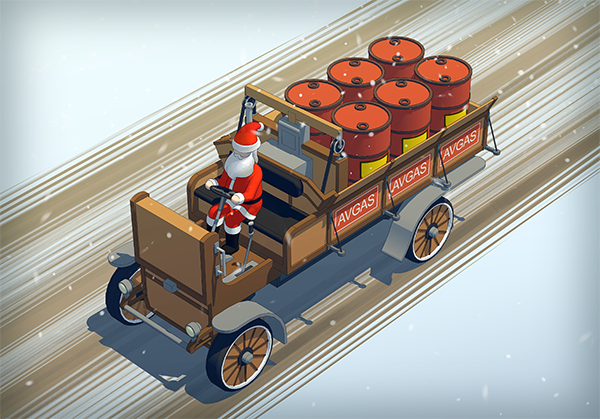 At the same time the garage remains in the game, in it vehicles are serviced and maintained when the time comes. A progress bar in the window of each vehicle shows how much time your vehicle has left before it needs to be serviced. 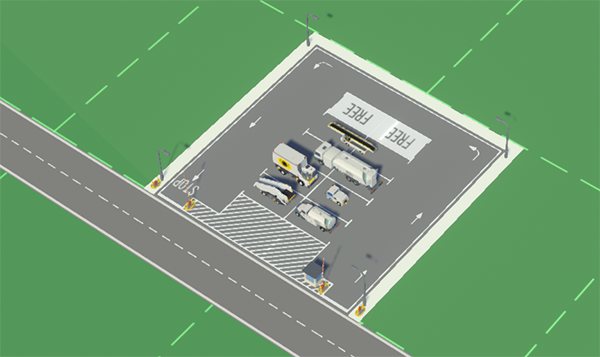 The refueling service now consists of two types of buildings – Fuel Storages and Fuel Stations. Storages are responsible for the amount of fuel at the airport, and Fuel Stations for timely refueling of Fuel Trucks. The progress of refueling is now displayed in real time in the Fuel Station window. Linkin park. Parking link. 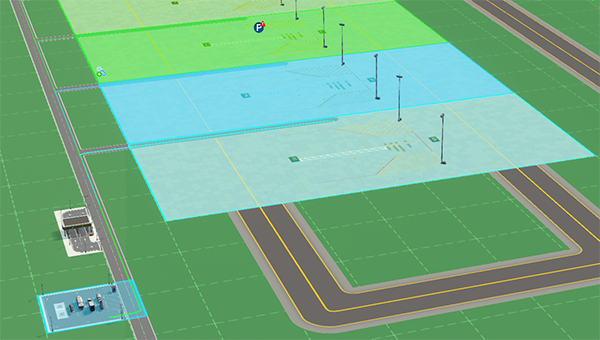 Each parking lot can be connected to certain ramps. Thus, specific ramps can be serviced by specific parking lots. 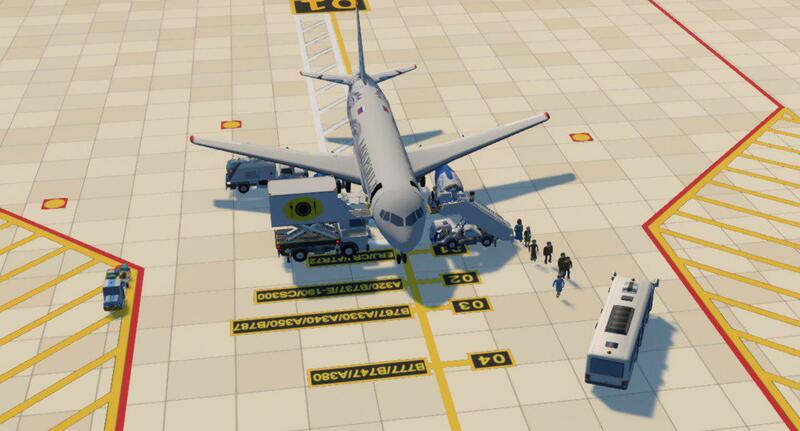 Thanks to this, the player will be able to prioritize service and optimize logistics on the airfield. Negotiations. Yes, now the player can negotiate changing different parameters of the transaction before signing it. At first, there is little that can be changed, but by improving his negotiation skills (yes, research), the player will be able to adjust more and more contract parameters. Speed. We slightly changed the speed of the game and added another speed. Now, on the one hand, you can see how everything moves smoothly and realistically, and on the other hand, if necessary, you can quickly fast forward time. Even at the fastest speed nothing breaks down and works as it should. First of all, we will continue to work on the stability of the game and prepare for release. Even more interfaces and tools to manage the game. Implementation of the new services at the airport: Water, Waste Management, GPU (ground power unit), Pushback (!) and others. Something secret that we are working on, but for the time being we are not revealing it. Subscribe to our newsletter to not miss the announcement of closed testing. Happy holidays. Real Welders Team. Couple weeks ago we showcased the game at Gamescom in Köln. The special build was made for the exhibition. Most of them are about gameplay convenience. Such as building-to-road snapping etc. But also you can check out a new traffic system. If you still didn’t know, we have important news. Sky Haven’s Steam page has been launched! You can find all the important updates and discussions there. We still issue devblogs although not as often as we want, but at least we answer quickly on the steam community forums and our website forum. New UI – many many windows and elements – DONE! Runway as a checkpoint: proper use, minimum interval, departure and arrival queues, etc. Queue corridors. As game a lot about queue systems this is a very important feature. Traffic system on apron. You can notice that all the vehicles move in the center of the roads and can pass through each other. Time to fix this. Also we going to publish a new video next few weeks. Some issues have to be fixed before that and we will introduce four services (luggage, passengers, fueling, catering) working. 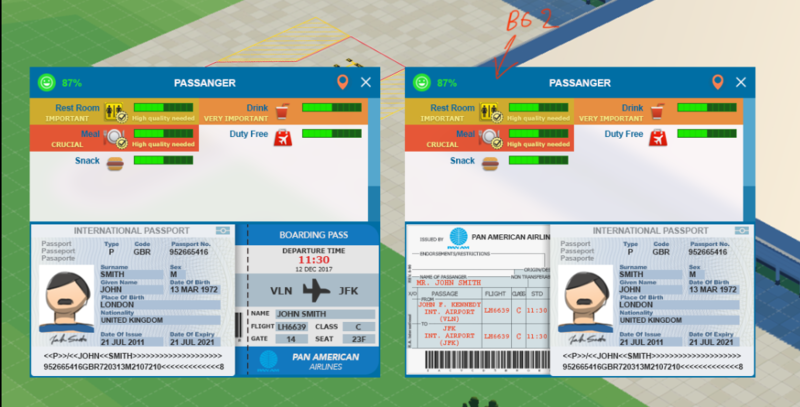 In this devblog we reveal a bit how interaction works with airlines. The types determine the main focus of an airline. E.g. some discounters have privilege class, but mainly they are lowcosters. Or International airlines can make domestic flights with a small airplane but mainly they use big planes for long haul flights. Discounters need few services, but a fast turnaround. International types, on the other hand, need many different services and are more focused on quality. Domestic airlines can combine options of the other two. Each type of airline tends to use specific airplanes: wide-bodies for international, narrow-bodies for domestic and discounters. Also some domestic types can have small airplanes often and medium sized planes are usually popular with discounters. One more difference in passengers. Discounters’ passengers don’t require much in the airport. Just some snacks and drinks and they won’t be upset much if they won’t find any. Domestic airlines have more demanding passengers. Also they have business and 1st class passengers that want something more comfortable than a snack booth. On the other hand they pay more. Finally International airlines have even more bizarre passengers, including VIPs. They require lounges, luxury cafes etc. After passenger leaves, he or she rates the airport. 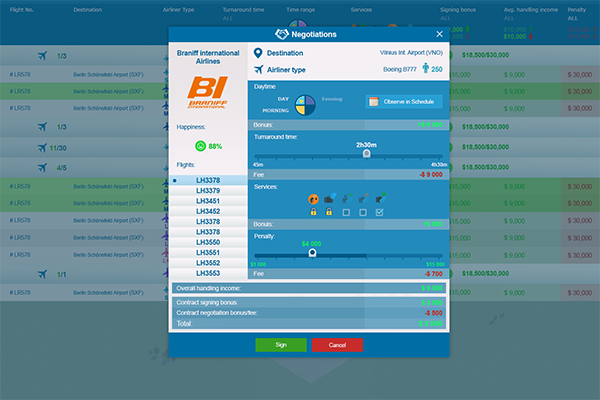 Rating is very important as it defines how current and new airlines will cooperate with the player. 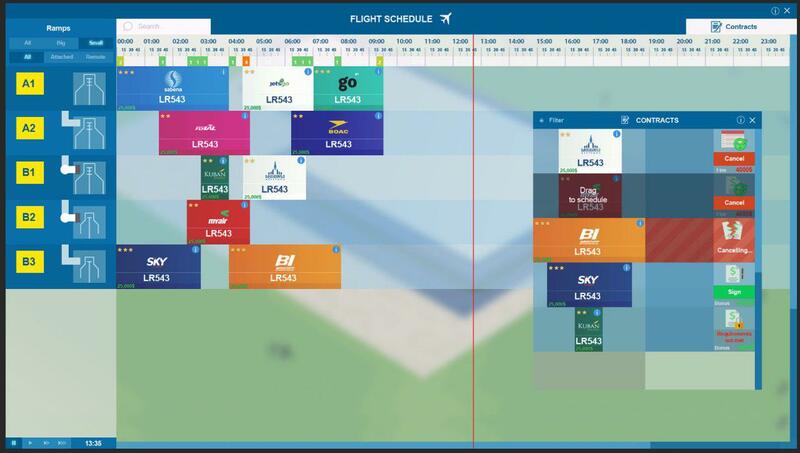 when scheduling and performing flights of a specific airline, the player gets “relationship points” for that airline. When there are enough points, new relationship level is unlocked. Each level offers challenges and benefits. Challenges consist of rating, common infrastructure (e.g. 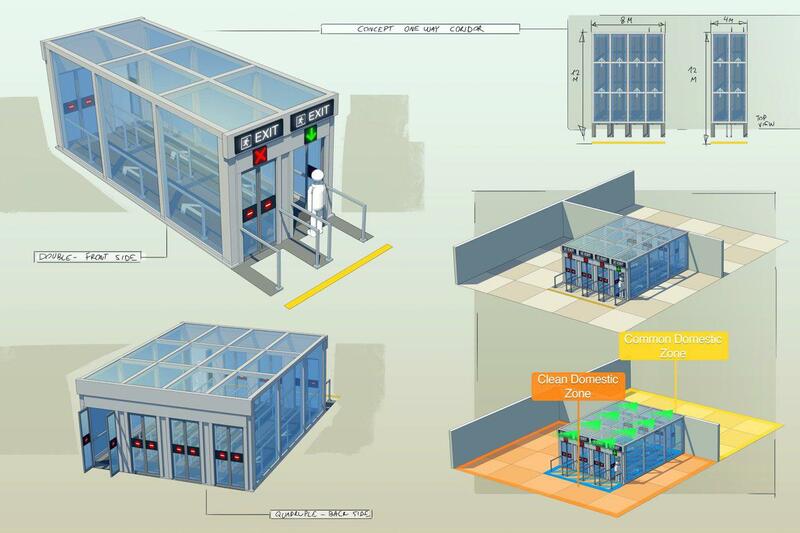 total number of gates), dedicated infrastructure (e.g. number of gates dedicated to the airline). Benefits make up more flights to the airport. Finally an airline could decide to make a hub in the airport. This will bring even more flights and passengers but also it will impact gameplay with strict requirements. Buses attracted our attention again. Some bus drivers didn’t want to deliver passengers to gates. Sometimes they even drove them directly to the garage. We have to work a bit on their navigation and motivation. Fueling mechanics and fuel supply are almost in the final stage. 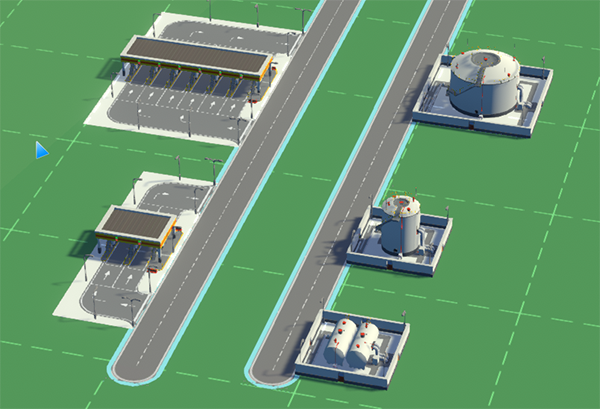 Now fuel station has max amount, replenishing speed etc. If it is necessary, fuel trucks can refill their tanks. Of course all the parameters are upgradable via research. All the vehicles now know their place on the ramp. It’s important because we plan to add even more services so there has to be order on the ramp. We polished the look of the game. Lighting system was highly improved. Instead of catering we decided to implement baggage handling. As it is more important in airports. Multi-unit requests (still in progress). Even more optimization and debuging. As project grows we have to pay attention to this more and more. New UI! It’s time to change prototype interface to something more fancy and convenient. However it’s still not final. See you in the next devblog! Coming (we hope) soon! We are glad to welcome you back to our irregular blog! Much has happened since the last letter. 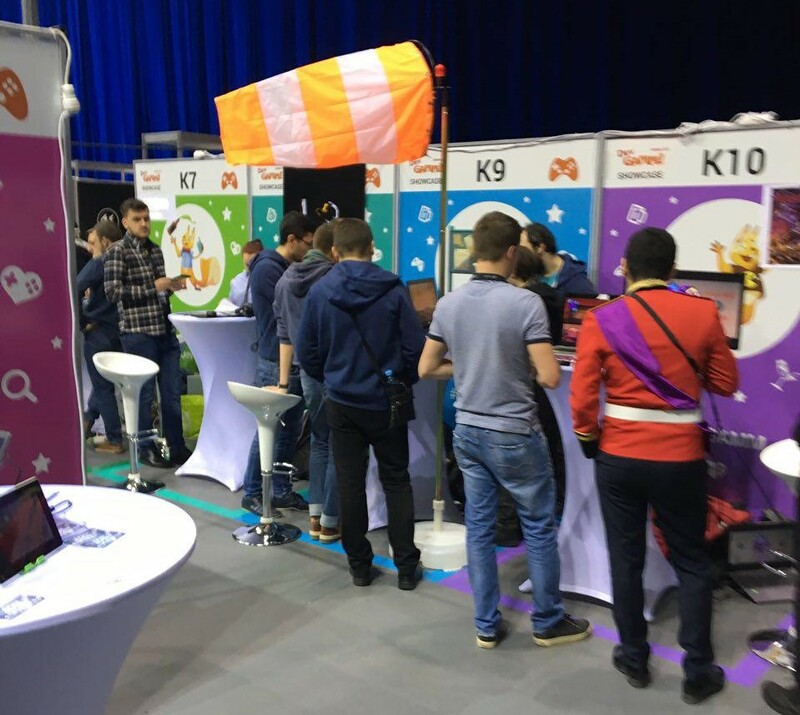 First of all we took part in a conference – DevGAMM Minsk 2017. We are eager to share some interesting videos from Game Lynch (one of the events on the conference) with you. We all had lot of fun and useful feedback. Many new weird bugs as well. Today we will talk about an airport zoning. All spaces in the terminal are split into zones: international, domestic, clear, common, etc. Some of these zones can overlap onto each other: Clean Domestic, Clean International, Common Domestic, etc. But some can not: impossible to have “Common International”. Zones are formed by entrances and gateways. E.g. Security check has “Clear” zone on it’s exit, “Passport control” has “International”, etc. Of course there are several rules how to resolve instances where different gateways lead to different zones in the same area. Zones determine which objects can be constructed. Duty free can only be in the “International” zone, Passport control – only in “Clean” zone, etc. However gates coulcand be placed in almost any zone. At the start you don’t really care about this. Only the most undemanding airlines will agree to work with you. But when you will want to cooperate with bigger companies, your airport will have to provide Security Checks and Gates in “Clean” zones. 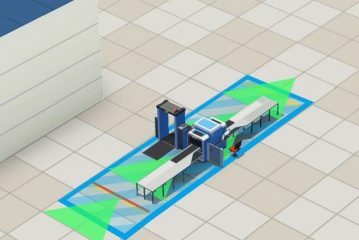 With International flights you will need Passport controls and “International” zones. In a big multi-zoned terminal it could be pretty challenging to manage all the flows and gateways. Thanks to the DevGAMM preparation we greatly improved game stability and polished a lot. When you demonstrate a game to a fresh audience, you want to have all the small bugs cleaned. Also Game Lynch and the showcase event gave us a lot of new ideas and inspiration. We have improved our core apron management. The system known as “Ground Units & Landed Aircrafts’ Guidance” has been cut. We have new one “Enhanced-On-Land-Guidance” instead. It much more advanced and fast. New abbreviation for the system sounds much better as well. Do not hesitate subscribe our twitter. There are something interesting there: new remote ramps with “drive-through” for aircrafts(Twitter) or super awesome take-off and landing. Checkout this video (Twitter). First of all we will make an effort to post devblogs more often. Currently we are working on a Catering system. It will be ready soon. Each service can demand more than one unit. Especially for big planes. E.g. 3 or 4 apron buses. All tech vehicles will have correct waiting positions near ramps. 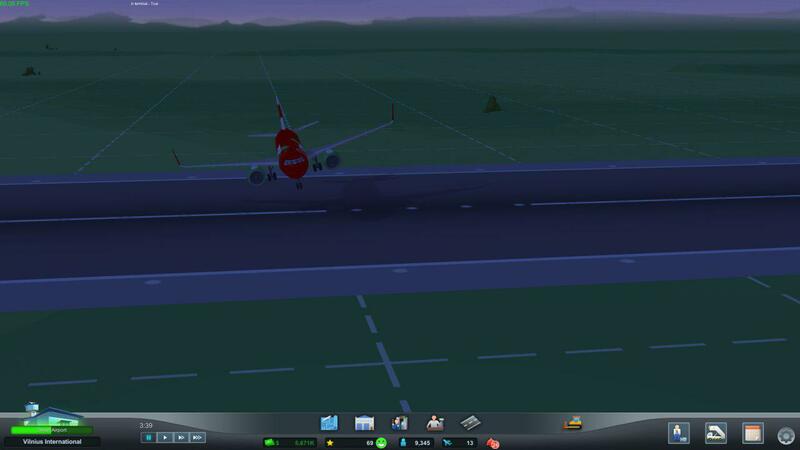 And smaller versions for ramps and runways will be added soon. We will continue to make the economy system and other stuff. Now it’s time for us go back to development. Long time since we’ve given any word. We even missed(skipped) the September devblog. Though we’re still sharing a lot on our twitter. The tweet about this devblog will be #100 as a matter of fact. First of all – important news: we are showcasing in the Devgamm conference which will be held in Minsk, Belarus. On the 17th of September we will show our first playable version of the game. So we will glad be to meet everybody who wants play and grab a couple of stickers. Jet bridges. Simple and complex. With one, two or even three connections. One boarding/disembarking option is never better than another just by default. There will be a demand for each type: discounters require simple and cheap means, internationals require conveniency for their passengers. It’s the player’s choice of how and what to work with. Of course there is a lot to be polished here. Sometimes we find strange features or possible bugs. E.g. a passenger who can’t find the exit stays in the airport and live there forever like in the movie “Terminal”. We will continue to polish and fix current features. Have you checked out our new current UI? We will make it even better. Also we will work a bit on vehicle physics and make movement more realistic. We continue to add new content based on the current core game. It means new services for passengers and airliners. And last but not least! We are finally starting to sharpen the economy balance using not only pre-planned spreadsheets but also the real game. Despite all the raining this summer we still had enough heat from work and made some important decisions. We’ve done quite a big load of work and made some important decisions. Also our team is growing – we have a new Unity/C# developer. His participation will greatly accelerate the development. And strengthen our confidence in the release on time :). Design – our approach, thoughts and key features. Reports – short summary with important tasks. Plans – what we are going to do next. Let’s start from the beginning and talk about Terminal and Apron construction. These objects are both built in a similar way. You can use a square or poly tool. The poly tool makes it possible to build any closed shape. However, the angles are limited to 45 degree steps. Of course all overlapping shapes will merge and form a single structure. 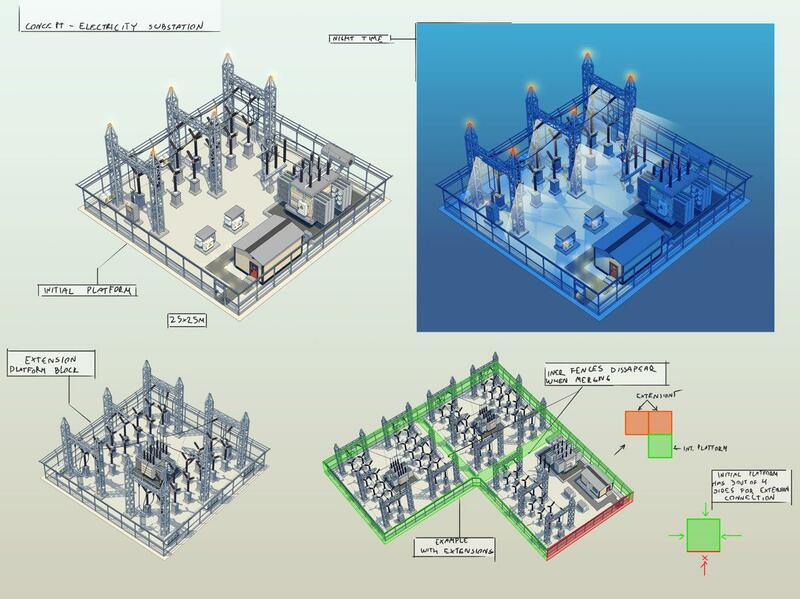 Another thing we would like to point out is the number of floors in the terminal. There are two floors but only one is playable (the second floor for now). It’s a bit confusing so let us explain. This is a result of a large number of tests, prototypes and discussions. Why we need two floors? Several reasons. Jet bridges that are attached to the first floor are looking creepy. 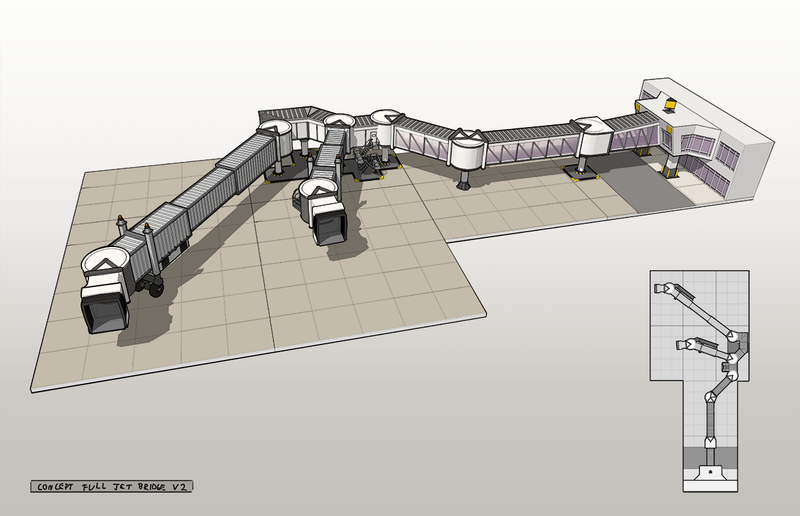 We also need some space to separate arriving and departing passenger flows. Why is (only) the second floor playable? First of all two visibly working floors are expensive technically and timewise. So for now all features related to 1st floor useage will in a way we call “1st floor magic”. E.g. all inbound passengers entering the terminal through a gate on the 1st floor exterior will come out to the 2nd floor through floor connecting Arrival Exits. Arrival Exits can be placed anywhere and this gives you control of the incoming passenger flow. At the same time outbound passengers will wait on the second floor until a departure gate will be free (by schedule).After that they will go through a gate door on the second floor and go onto the jet bridge, bus or walkway. This let us to avoid a mess at the gate door. Internal tests and Beta will show whether or not this is a good decision. New walls(two floors) and a roof that fades in/out depending on the zoom. Separate lighting inside terminal. Floor and apron textures + sweet grass layout generator. Request and schedule systems. Core of the game logic. Now it’s working and makes us happy. Passenger boarding and disembarking via walkways or buses! And passengers disembark by aircraft stairs. And everything works within schedule. It was a serious challenge but we got through with it. Fueling for planes is still in progress. Some final strokes to be done. Lots of models and concepts. You can check out our twitter. A lot of stuff was added. Now we need to fix all issues and bugs. This is the main focus for next month. After that we will happy to share a lot of videos! This week we finished some important tasks and features. Main focus was on core systems for aircraft ground services. Also lot of fixes and improvements. We continue working on depo-based services and overall UX improvement. This is our very first log record. Not much to say yet, but interesting things are on their way. For now the main news is the release of our website and forum. This site will work together with our other channels to provide you with all the fresh and tasty news about Sky Haven’s development. Welcome everyone. P.S. We will also run a Steam account soon.